Exactly 10 months ago a mysterious Queen Chrysalis popped up on AliExpress, together with a brushable of Sandbar. While the latter has long been released, the changeling queen with updated eyes wasn't seen again. 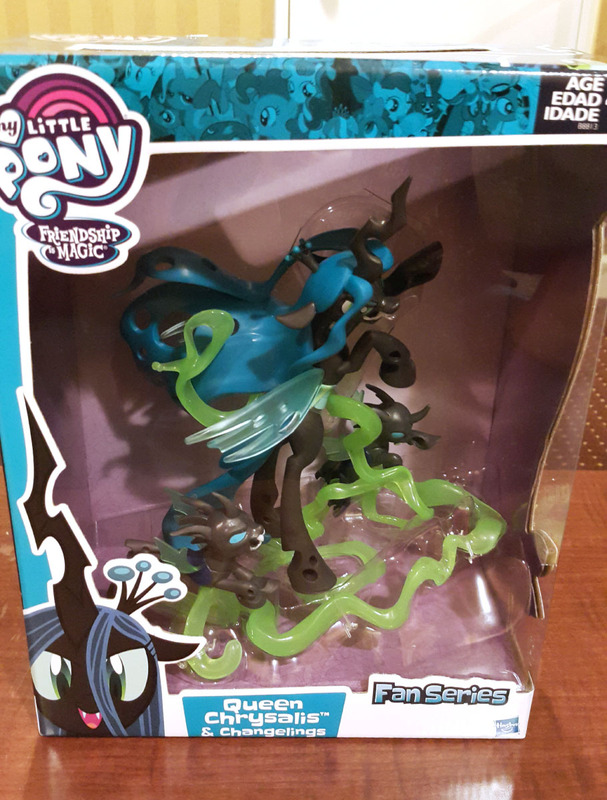 Until now, as JCPenney released their first My Little Pony exclusive, that includes the Queen Chrysalis figure! 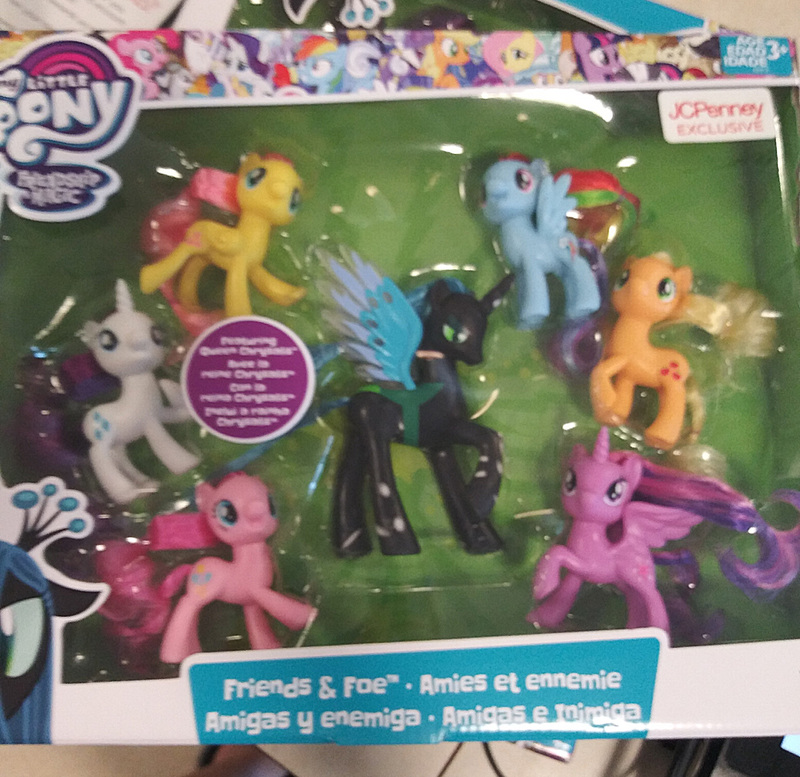 While this release may not bring any new mold or characters to the shelves, it's good to see that JCPenney is also invested in releasing exclusive My Little Pony stuff, as Toys"R"Us is no longer able to release these lines in the US. 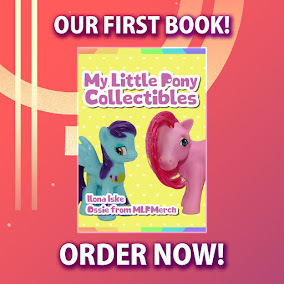 I don't expect a large line of, let's say Ponymania, to come from JCPenney, but it's s slightly bigger chance at getting new releases nonetheless. 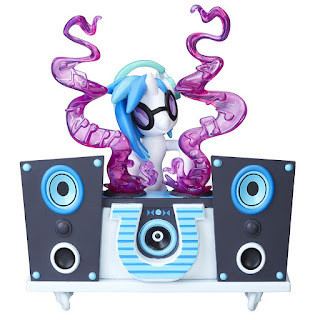 We already knew that the upcoming My Little Pony movie was going to play a big part in this year's line-up, and besides the regular brushables we can now confirm that the full range of Guardians of Harmony figures will be based on MLP The Movie. In the photo above (credits to MyFroggyStuff) you can clearly see all the sets that are currently on display at the New York Toy Fair, most of which we've seen in the MLP The Movie press release from Hasbro themselves. The only figure not announced before is Stratus Skyranger, who will be this wave's "big figure", just like Spike was in 2016. 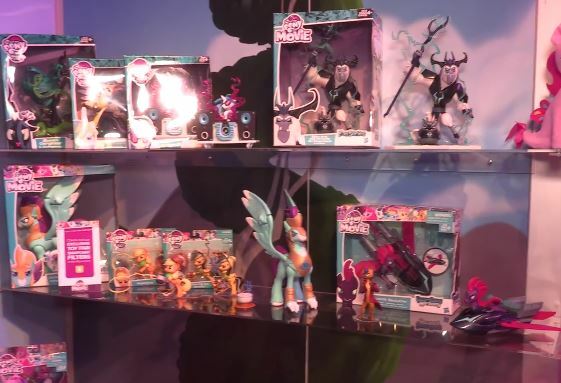 For now the Storm King + Grubber statue is the only announced figure in the Fan Series range. More may follow later this year. A quick store finds post today as we've gotten quite some finds in a short time, and why wait? 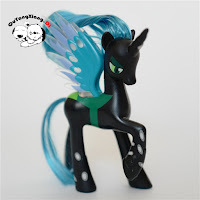 Below you can find some finds of really recent releases, being the Guardians of Harmony Queen Chrysalis Fan Series figure and the Fluttershy Runway figure. Last week we asked for your thoughts on the new Wave 19 Blind Bags wave, which is the first rebranded blind bag set. The majority of you do like the new wave, mostly because of the new characters or the theme. Other popular votes are also from the 'yes'-side from fans of the poses or the fact that no mane 6 ponies are included. 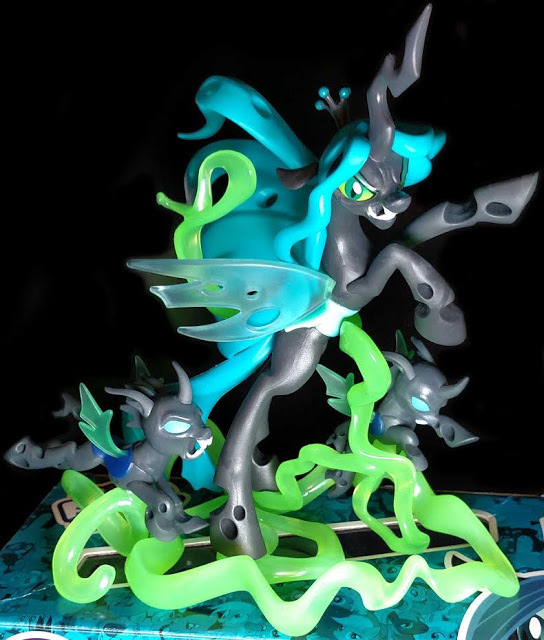 This is followed by the amount of people who actually would like to see the mane 6 in this wave, probably hoping for some new molds of all 6 (and I wouldn't blame you). All the other votes got 5% of the votes as maximum, consisting of most no or other votes. A very sudden surprise for all the Queen Chrysalis and Guardians of Harmony fans out there! Out of nowhere ThinkGeek has started selling the Queen Chrysalis & Changelings Guardians of Harmony set. So far we only had an Amazon listing of the set, but no further announcements or sneak-peaks, and here it is, available in store and all! 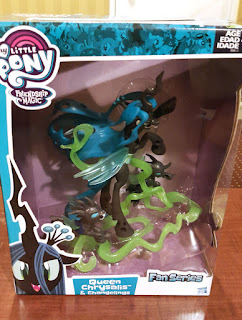 Based on the molding and box we learn that this figure is part of the Fan Series figures, in line with the current Discord, Princess Celestia and Nightmare Moon figures with detailed molding and comic-based poses. 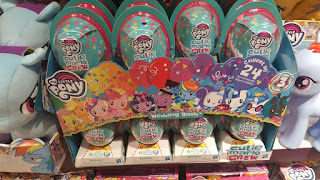 The availability of this set can be an error and ThinkGeek can pull it from the shelves at any moment, so if this is a must-have for you, you might want to check out ThinkGeek stores, especially the one in Humble, TX (US) where this one was found. Credits to Hunter for the photo! 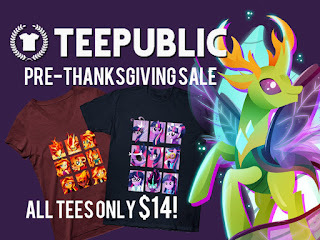 Teepublic's Pre-Thanksgiving Sale has Arrived! 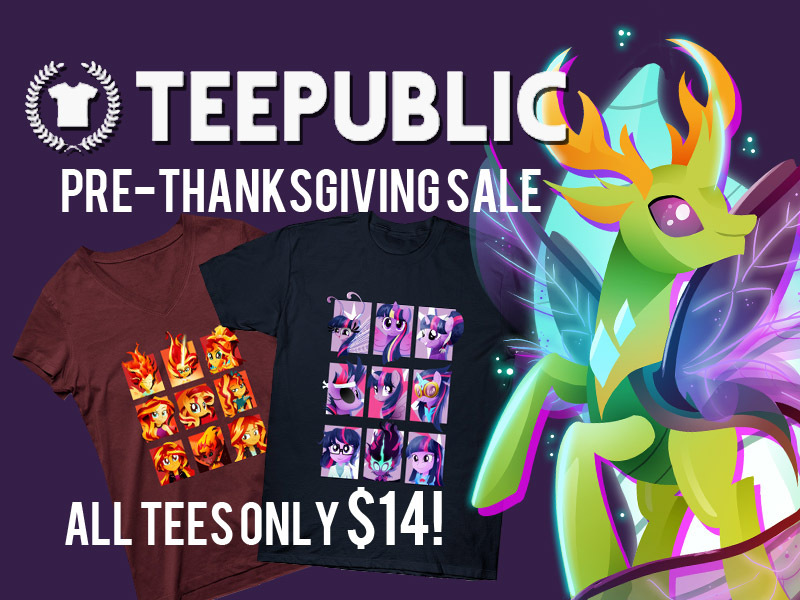 Teepublic's Pre-Thanksgiving Sale has arrived! From now till the end of the week you can all T-Shirts just for $14 each! But tees aren't the only thing that are on sale, Teepublic offers lots of other items as well like Mugs, Phone Cases and Prints. 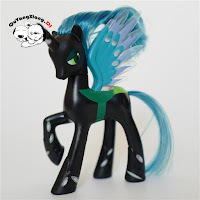 For the occasion I've also made some new designs related to the Season 6 Finale with "King" Thorax. More new designs will eventually follow so check out our store often for new designs. We've included the link to our Merch Page and specific listings below! 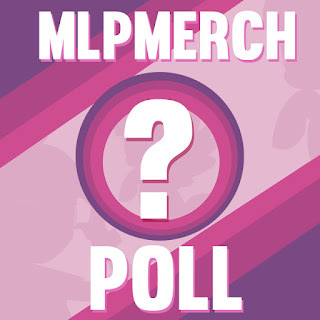 Visit our Teepublic Merch Store here!